Top 5 Updates in 2017-2018! Contact HelpDesk to learn more about FDpay! This free feature allows you to track attendance hours for preschool, daycare, before and after school care, and more! When combined with Finance, you are able to bill a family’s account directly with just a click! This free feature allows you to track attendance hours for preschool, daycare, before and after school care, and more! When combined with Finance, you are able to bill a family’s account directly with just a click! Taking attendance for multiple homerooms has now been made much easier with the new Primary/Secondary feature! If your school has multiple homerooms for different preschool schedules, this feature will help save you time and confusion! Click here to watch the video tutorial on setting up Primary/Secondary accounts (MP4) or watch in Youtube! Click here to watch the video tutorial on taking attendance (and lunch) with Primary/Secondary accounts (MP4) or watch in Youtube! For many of our schools, keeping track of students who come in late, leave early, or leave during the middle of the day often requires the help of someone who is not always an administrator. With a principal’s request, we can give the Monitor icon to a non-administrator on the staff list, such as a volunteer, to help out with tracking attendance in the school’s front office. The Monitor icon will allow this person to mark students as absent, tardy, leaving early, and middle outs as well as leave notes for any attendance issues. If this is something you are interested in having at your school, please have the principal send an FDmail message to HelpDesk with this request and the name of the staff person who will need the Monitor icon added. Registration is an important time of the year for schools and we want to help with that process. We have added a verification report to help track when parents saved their parent information. This report will be helpful when a school needs to make sure all parents are verifying their personal information in FastDirect, especially around Registration or at the beginning of the year. Checklists for the New School Year! School is right around the corner and it is time to get your ducks in a row! FastDirect wants to make sure your school is ready. In addition to completing the Summer Transition steps, there are several other items to be addressed. To stay on top of the many features and settings that need to be reviewed for the start of school, we have created a checklist for administrators, teachers and parents. Also, don’t forget about our timeline to help you stay on track and make sure your school is ready to go for next year! Click here to view the administrator checklist! Click here to view the teacher checklist! Click here to view the parent checklist! HelpDesk is dedicated to helping make the Summer Transition an easy process and allow you more time to enjoy your summer break. Please contact HelpDesk to set up a time when you will be ready to go through the steps. Once these steps have been completed, please notify HelpDesk so that they can move your school forward to the new school year. With the addition of the Summer Transition steps, we thought we would include a Summer Timeline! The timeline is designed to help you stay on track and make sure your school is ready to go for next year! To view the timeline, click here! We are highlighting the features we believe are key to keeping parents connected and informed as well as strengthening your school’s mission! Step 1 – Make Communication Convenient! Email Forwarding is an optional feature that allows FDmail messages to be forwarded to the recipients’ preferred email. With Email Forwarding, the recipient no longer needs to log into FastDirect to check messages. Messages can now be read quickly and easily from any smart phone, home or work email address! Text messaging is an optional feature that allows FDmail messages to be forwarded to the recipients’ cell phones. This feature is also referred to as SMS Text notifications. Due to the nature of text messaging, only the first 90 characters (approximately) of the FDmail message will be sent in the text message. FDbroadcast is designed to allow principals (and selected staff) the ability to message the school community in multiple methods in case of an emergency or urgent situation. FDbroadcasts uses all messaging options available, including Email Forward, Text Messaging and FDmail messages. Step 2 – Incorporate Your School’s Branding! The login page can be one of the first places parents interact with your school. This is why it is a perfect place to make your school become unforgettable! Let FastDirect help enhance your login page by adding your school’s emblem, mission statement, school colors, mascot or awards, and/or images of the school, students and events. Report Cards are an obvious extension of your school and its mission. 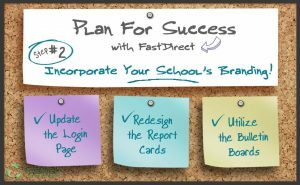 FastDirect can help you re-evaluate your report cards and create a sleek, organized and formal layout. By reviewing the report cards for all grade levels, you will have a consistent and unified document that represents your school in the best way. Bulletin Boards are a valuable way for your staff to share school information. The individuality that comes through for each staff person makes your school personable and engaging. With a few uniformed details, these bulletin boards will help serve in displaying your school’s mission. Step 3 – Make Important News Accessible! The File Upload feature allows staff to attach files to FDmail, bulletin boards, grade books and Links. For teachers, this is an essential tool to help communicate with parents and students. When parents and students have the ability to upload, this facilitates complete communication and opens the door for a more engaging learning process. 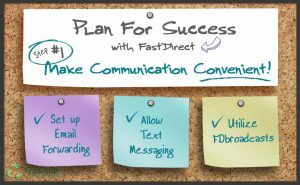 Monthly mailers, weekly reminders, letters from the principal — No matter what form your newsletter takes, Fastdirect can help you make it available to the whole school community. 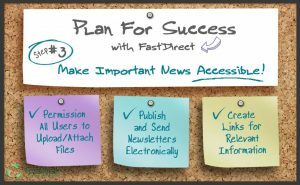 There are several options for posting your newsletter on FastDirect, as well as sending it out as an attachment or as a link. The Links icon is your gateway to information. For any document, form, or website that needs to be shared with the school community, the Links page is the place to go. In addition to administrators, teachers are also able to add links which can be used as a reference library for their students and parents.